These are seriously fantastic. One of the first things i baked after we got married & a friend requested I make them for a recent get together we had. So i did. Just make sure you have time because they do chill in the fridge for an hour before baking. =) Super easy, though! & Delish! Better Homes & Gardens Cookbook. 1. In a medium mixing bowl beat butter with an electric mixer for 30 seconds. Add the 1 cup sugar, baking soda, & cream of tartar. Beat until combined, scraping sides of bowl occasionally. Beat in egg & vanilla until combined. Beat in as much of the flour as you can with the mixer. Stir in any remaining flour. Cover & chill dough for an hour or until easy to handle. 2. Preheat oven to 375. Combine the 2 tablespoons sugar & the cinnamon. Shape dough into 1 inch balls. Roll balls into sugar mixture to coat. Place 2 inches apart on ungreased cookie sheet. Bake 10-11 minutes or until edges are golden. Transfer to a wire rack, cool. 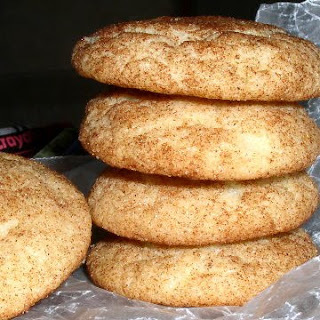 But these are total complete deliciousness, they turn out PERFECTLY everytime, so you should try it if you're looking for a good cookie recipe!